A fully integrated multi-platform information and marketing service for business management and solution providers who wish to profit from the emerging business of Enterprise Engagement. 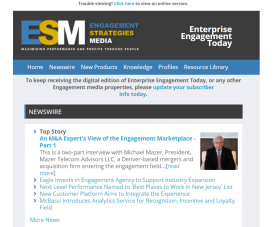 Subscribe to the ESM eNewsletter at EnterpriseEngagement.org. Engagement Strategies also serves management at the growing number of Engagement solution providers seeking new ways to add value to their client relationships. Research, case studies, best practices etc. in bite sizes on demand via their smart phones, tablets, or computer. New products or services that can help them achieve key results when they are ready to buy or recommend them. Ammunition advocates for your product or service to convince top management or their colleagues. The first ever Engagement Buyer’s Guide. 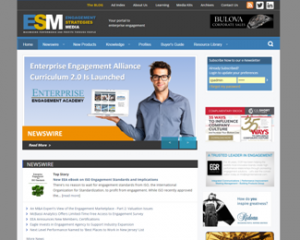 Click here for a regularly updated listing of solution providers in all areas of engagement.